For Final rites in Sikhism, see Antam Sanskar. Antyesti (IAST: Antyeṣṭi, Sanskrit: अन्त्येष्टि) literally means "last sacrifice", and refers to the funeral rites for the dead in Hinduism. This rite of passage is one of traditional Saṃskāras in the life of a Hindu. It is also referred to as Antima Sanskar, Antya-kriya, Anvarohanyya, or as Vahni Sanskara. The details of the Antyesti ceremony depends on the region, caste, gender and age of the dead. Antyeṣṭi (अन्त्येष्टि) is a composite Sanskrit word of antya and iṣṭi, which respectively mean "last" and "sacrifice". Together, the word means the "last sacrifice". Similarly, the phrase Antima Sanskara literally means "last sacred ceremony, or last rite of passage". 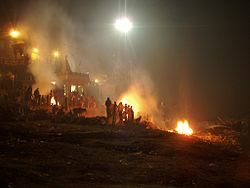 A Hindu cremation rite in Nepal. The samskara above shows the body wrapped in saffron cloth on a pyre. Burial In Hinduism: Apart from the cremation method there are large sects in Hinduism which follow burial of the dead. The preparatory rituals are more or less similar to cremation viz, washing the body, applying vibuthi or chandam on the forehead of the deceased etc, but instead of cremating, the deceased is buried. The body is either placed in sleeping position or in some Shaivite and tribal traditions is in sitting position legs folded and arms resting on the thigh simulating meditative position. The burial pit is prepared in the community burial ground called Shmashana, usually situated outside the city or village. Some affluent will bury their dead in the own field. The burial pit for sleeping position is generally three feet width and six feet in length and for sitting position it is three feet by three feet. As a thumb rule in all the sects invariable the saints are buried in sitting position in a separate place where later on a Samadhi is built which becomes a place of worship. The cremation ground is called Shmashana (in Sanskrit), and traditionally it is located near a river, if not on the river bank itself. Those who can afford it may go to special sacred places like Kashi (Varanasi), Haridwar, Prayagraj (Formerly known as Allahabad), Sri Rangam, Brahmaputra on the occasion of Ashokastami and Rameswaram to complete this rite of immersion of ashes into water. Cremation of the dead by Hindus in Ubud, Bali Indonesia. Both manual bamboo wood pyres and electric cremation are used for Hindu cremations. For the latter, the body is kept on a bamboo frame on rails near the door of the electric chamber. After cremation, the mourner will collect the ashes and consecrate it to a water body, such as a river or sea. 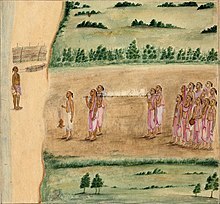 Hindus brought into Trinidad as indentured laborers for plantations between 1845 and 1917, by the British colonial government, suffered discriminatory laws that did not allow cremation, and other rites of passage such as the traditional marriage, because the colonial officials considered these as pagan and uncivilized barbaric practices. The non-Hindu government further did not allow the construction of a crematorium. After decades of social organization and petitions, the Hindus of Trinidad gained the permission to practice their traditional rites of passage including Antyesti in the 1950s, and build the first crematorium in 1980s. 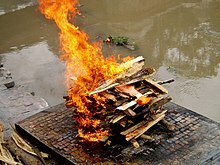 In the United Kingdom, it was formerly illegal to conduct a traditional outdoors Hindu cremation under the 1902 Cremation Act, with Hindus having to cremate their dead in indoor crematoriums instead. In 2006, Daven Ghai, a British Hindu who had been refused the right to have a traditional funeral by Newcastle City Council, brought a case to court in which he claimed that the current law did in fact allow open air cremations, so long as they were in some enclosed building and away from the public. A High Court ruling disagreed with his claim, and the-then Justice Secretary Jack Straw stated that the British public would "find it abhorrent that human remains were being burned in this way." Nonetheless, upon taking it to the Court of Appeals in 2010, the judge, Lord Justice Neuberger, ruled that such a cremation would be legal under the 1902 Act, so long as it was performed within a building, even an open-air one. Upon his victory, Ghai told reporters that "I always maintained that I wanted to clarify the law, not disobey or disrespect it" and expressed regret at the amount that the trial had cost the taxpayer. He stated that he was thankful that he now had "the right to be cremated with the sun shining on my body and my son lighting the pyre" and he and other Hindus and Sikhs in the country had begun investigations into finding a site upon which they could perform the funerary ceremonies. ^ a b Carrie Mercier (1998), Hinduism for Today, Oxford University Press, ISBN 978-0199172542, p. 58. ^ Colin Parkes et al (2015), Death and Bereavement Across Cultures, Routledge, ISBN 978-0415522366, pp. 66-67. ^ Hiro Badlani (2008), Hinduism: Path of the Ancient Wisdom, ISBN 978-0595701834, p. 292. ^ Denise Cush, Catherine Robinson and Michael York (2007), Encyclopedia of Hinduism, Routledge, ISBN 978-0700712670, p. 38. ^ a b Marion O'Callaghan (1998), "Hinduism in the Indian Diaspora in Trinidad", Journal of Hindu-Christian Studies, Vol. 11, No. 5, pp. 2-10. ^ a b c Taylor, Jerome (2010-02-10). "Hindu healer wins funeral pyre battle". The Independent. London. Retrieved 2010-04-25. ^ Roy, Amit (2010). "UK funeral rights for Hindus". The Telegraph. This page was last edited on 5 February 2019, at 05:05 (UTC).